THE STORY - The world's top protection agent is called upon to guard the life of his mortal enemy, one of the world's most notorious hit men. The relentless bodyguard and manipulative assassin have been on the opposite end of the bullet for years and are thrown together for a wildly outrageous 24 hours. During their journey from England to the Hague, they encounter high-speed car chases, outlandish boat escapades and a merciless Eastern European dictator who is out for blood. THE GOOD - Reynolds and Jackson are fun to watch, and there are some pretty funny moments throughout the movie. THE BAD - A depressing lack of originality makes this a pretty forgettable experience. ​In a world without "48 Hrs.," "Lethal Weapon," or "Midnight Run," maybe "The Hitman's Bodyguard" would be more enjoyable. But we don't live in that world, and this film is unfortunately just another buddy action-comedy. Though this movie won't impress you with much, there are a few laughs to be had. 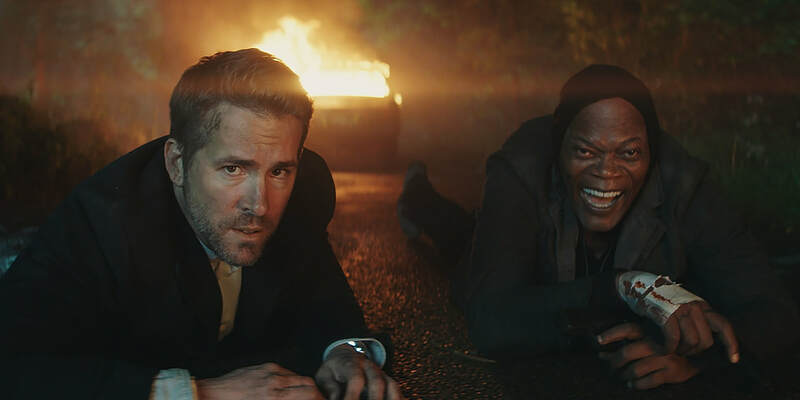 Ryan Reynolds and Samuel L. Jackson pair up as two hitmen who just don't get along. Michael Bryce (Reynolds) is the straight-laced one with all the rules (quite literally), while Darius Kinkaid (Jackson) is the foul-mouthed loose cannon. No really, the characters are exactly that generic. From the start, you know exactly how their relationship will change by the end of the film. Kinkaid is summoned to testify against ruthless dictator Dukhovich (Gary Oldman), but he needs to survive the trip to the courthouse, as a seemingly never-ending stream of henchmen tries to take him out. Shockingly, Interpol can't seem to protect him, and they've got a deadline to get him from England to Amsterdam. When Agent Amelia Roussel (played by Elodie Yung) suspects they have a mole inside Interpol, she calls her ex-boyfriend Bryce to come in and take over as protection for Kinkaid. Here we get the obligatory and undercooked romantic subplot. Bryce is mad at Roussel for what she did when they were together and vice-versa. It's all quite boring. There aren't any real stakes or purpose to the relationship, though not for lack of exposition. Ultimately the audience is left just waiting for them to get back to the jokes. Even though the story is laughably unoriginal, the movie coasts off the charisma of Reynolds and Jackson to mild success. They have some great chemistry, and their interplay is often pretty enjoyable. Watching Jackson mock Reynolds and laugh through constant assassination attempts makes this movie tolerable. There's no shortage of jokes and witty banter, but with only a precious few laugh-out-loud moments, the movie simply isn't as funny as it needs to be to overcome the well-worn construct. The action isn't much better here either. Quick cuts and frantic shaky-cam don't pass for anything special anymore, and there's far too much of both throughout the movie. Once the film hits the third act and the stakes are raised, things actually start to pick up. Chase scenes through the streets and rivers of Amsterdam are the best sequences in the whole film. There's a scene following Reynolds as he runs through multiple stores that's surprisingly well-executed. Why did it take an hour and a half to get to the impressive action? With a legend like Gary Oldman as the big villain, one might've expected some great, frightening moments. Sadly that's not the case, as Oldman's character really only sits in custody for the majority of the film. Instead, our heroes fight and kill dozens of random henchmen, which doesn't exactly help the audience care. Throughout the film, we get to meet Kinkaid's wife Sonia, played to great effect by Salma Hayek. She is totally committed to the ridiculous nature of the movie, getting some of the biggest laughs of the film. Along with Jackson and Reynolds, it's her dedication to the comedy (and to adding three F-words to every sentence) that makes it worth watching. ​Weak characters, a thin plot, and a few funny moments lead to a bland but inoffensive film. As far as action comedies go, we've seen far better, and we've seen far worse. "The Hitman's Bodyguard" finds itself somewhere in the unremarkable middle.